Before, jumping directly to source code, lets first discuss some important points. There are multiple ways to read child lightning components value in parent component. We can either use events or component method (aura:method). However, for event, we need to create a new event (Lightning event file) and register it. For aura:method, it doesn’t return any value. I wanted something very simple and found that Pass by reference concept works for Lightning Components also. Its very simple, create aura:attribute in parent lightning component, pass it to child component. Whenever child component changes value, Parent component would be notified. This can be seen in below source code in LookupDemo.cmp file. Below animation will give you some idea on how same lookup component page is used four times. Below Apex class is used as a Lightning component controller. Following source code is for Lightning Lookup component. Below component depicts on how same Lookup component used four times for different objects in same parent. Below component can also be used as reference to see how communication between lightning component can be done using pass by reference mechanism. Great! I have been searching google for a few hours and all I found was some outdated things. Thanks for a great work, I slightly modified your version to use reference from a parent component because I query all the fields and need to replace the parent values. I Tried but its not working , somecode changed in repo ? I do have lookup search functuionality in my application .But my requirement is when i will search some bad keyword which is not there and instead displaying “No result found”,it should display all the existing records so that user can choose from them. How to achieve this please help me out. i am big fan for you. i have small doubt. is it possible Creating recurring time-based actions in workflow or process builder. i want fire the my workflow rule every day. is it possible or not? Thanks Venkat for your words. There are multiple ways to do it. One easiest way is to write an Apex Scheduler to change record on which WF rule is written. As Scheduler will update some hidden field, WF rule will fire with Scheduler. Thanks Jitendra for your quick reply. My requirement is completely different that is remove the scheduler classes and implement the same requirement using workflow rules and process builder. I like your demo and I was trying to use your code from Github to try the lookup component but i dont see the Apex Controller Code listed in the Github. Thanks for the wonderful explanation and code. How can I auto populate some fields(custom fields from the related object) from the lookup object on the input:text field on the component page when lookup is selected by user? Please suggest me to achieve the List of Leads rendered based on search by name or email in lightning component. Works flawlessly. Question though: how can we embed this in an aura:iteration (list view) to allow a different assignment for each record? Currently when I select a value, it is assigning the same to ALL rows. Thk you for ur work (y), but it not working for me. Can u give some help plz ? The above code worked for me but my requirement is to make the lookup field mandatory on Ui. Since I am calling the sub component of lookup in my main component it doesn’t support required attribute. Is there any way to make the sub component required on my Ui? Thanks a lot for this solution. It works beautifully. I do have a question though – There is a lookup field to the account object on my lightning component which is being populated on init. 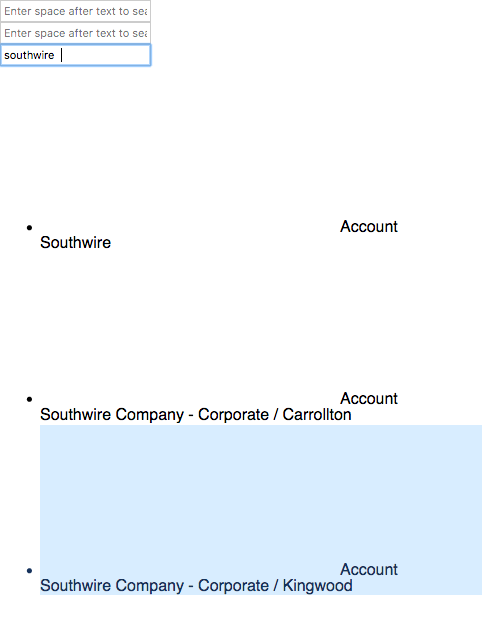 I am getting the Id of the account successfully but with the lookup component, that field is blank. How can I set it to display the correct account name on init? I haven’t been able to find license information for the code you share on your blog and gists. Can you clarify that, please? It seems from context like you are freely releasing this code into public domain with no restrictions, but I don’t want to use your work contrary to your intention. Thanks for asking. You can use code without any restriction. Thanks Jitendra! Do you mind referencing that in your ReadMe? Great work! I have the same questions like few of them below. 1. Making this Lookup component “required” on need basis? 2. Setting the value to the Lookup component on record edit? Use extends=”force:slds” in application containing lightning component. It will auto import slds styles. Hello Jitendra, thanks for posting this. I’m trying to use onChange with your component so that I can force another component to refresh, but the selItem is coming up as null. Here’s a portion of my component. The “mfr” attribute is the selItem. Here’s the onchange handler. I need to refresh the SGI list based on the account ID. The mfr object always comes up as null, even when I specify v.mfr.val. Any suggestions on what I could try? See JSFiddle for portions of the component and onchange handler. In the component, the “mfr” attribute is the selItem. The onchange handler should refresh the SGI list based on the account ID. However, the mfr object always comes up as null, even when I specify v.mfr.val. Nicely done – thanks for posting. Have you figured out how to get around the auto-complete dropdown that chrome lays over your lookup options list? As you probably know, chrome ignores the autocomplete=”off” option. Hi , thanks for the code, but could you please explain that how can i set the Default value in lookup. THank you for this code. I am using current visualforce page which includes lightningStylesheets=true and lookup gives me the classic. How do I add this to my visualforce page? Thanks for your code .I am currently using it for autocomplete component .When search bar result is empty, i want to pass that value which i typed in textbox .how can i do it . do you have any any code for autocomplete textbox. can you please help me out? how to get a search icon in search box? I have a Save button on my lightning component, which saves the record of a custom object. After saving the record I want a redirection to the lightning record detail page of that record. How can this be acheived.